Research by SFI Professor Sam Bowles on the co-evolution of agriculture and private property features prominently in a review in Current Biology about scientists' current understanding of the factors leading to humanity's transition from foraging to farming. "The archaeological evidence that has accumulated so far suggests that the introduction of farming wasn't a straightforward technological revolution driven by key inventions like the introduction of steam engines or airplanes," writes Current Biology's Michael Gross. "While the efficiency per hectare improved dramatically, the efficiency per person certainly did not, as Samuel Bowles from the Santa Fe Institute (New Mexico, USA) has calculated." A 2011 paper by Bowles found that the earliest farmers produced significantly fewer calories per work hour, on average, than foragers. Gross also cites a 2013 paper by Bowles and Jung-Kyoo Choi that examined the interaction between farming and the emergence of private property by modeling population dynamics, climate variability, different approaches to food provision, and different approaches to property sharing. The model showed that property rights among farming populations likely co-evolved with the introduction of farming methods, and only under tightly constrained conditions. 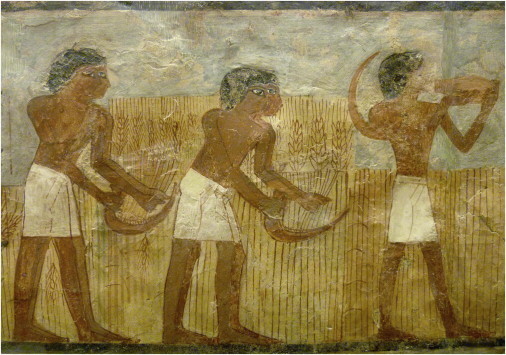 "Bowles and Choi argue that it was the co-evolution of food production and property rights—rather than technological progress based on inventions—that secured the success of agriculture in the Fertile Crescent and the small number of other regions where agriculture evolved independently at later times," Gross writes. Gross also reviews recent archeological evidence, which generally support the hypothesis that "a confluence of various developments catalysed each other...Only after millennia of slow changes did the early farmers gain the advantages that enabled them to push aside populations adhering to the earlier hunter-gatherer lifestyles."